A dedicated sales centre for DAMAC Tower Nine Elms with interiors by Versace Home – the first fashion-branded residences in London, UK – has been opened in Dubai to cater to the high demand from Middle East investors. The 50-storey tower overlooking the River Thames, which was launched in London in July, has seen all phase 1 sold out in just 10 weeks. “Following the launch of this exciting project in London, Singapore and Hong Kong, we are now making sales available directly here in the Middle East,” said Niall McLoughlin, Senior Vice President, DAMAC Ocean Heights Co LLC, DAMAC Tower Nine Elms’ sales representative in the Middle East. Due for completion in 2020, DAMAC Tower Nine Elms will be the first private residence project of scale in London to be fully designed and conceptualized by a luxury fashion house, with Versace involved in all aspects of design. 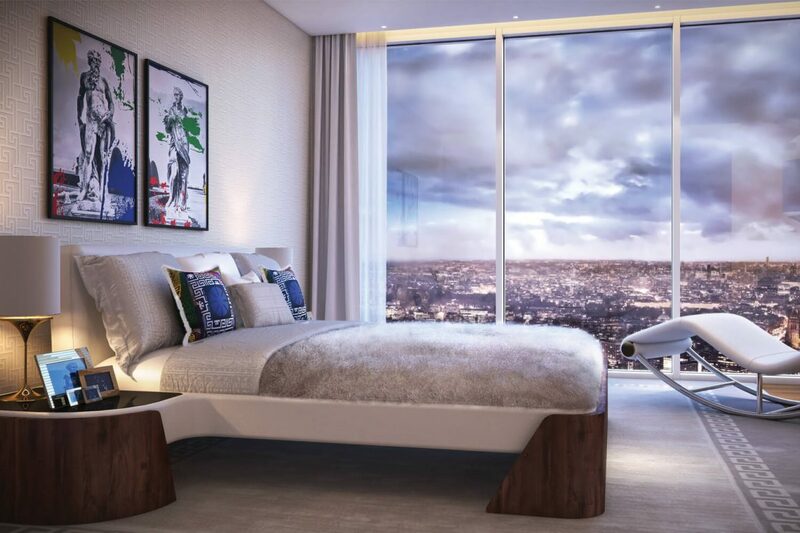 Prices for the luxury units start at £900,000, with units offering views of the City and River, to the Palace of Westminster and the London Eye. The lobby and interiors for each property will be expertly designed and fitted out by Versace Home. Amenities will include a state of the art gymnasium, indoor swimming pool & spa, an owners lounge, children’s play area, cinema and outdoor garden areas, all designed by Versace Home. DAMAC Tower Nine Elms, designed by architects Kohn Pedersen Fox Associates (KPF) will complement the emerging tall buildings in the northern part of the area, creating a clear distinction between the character of Albert Embankment and the form of the Nine Elms development, whilst contributing positively to the skyline’s variety of tall buildings locally. The London property market continued to experience growth in valuations in recent years, with real estate agency, JLL stating that the English capital remains the most liquid and transparent real estate market in the world. In its latest Investment Intensity Index, which compares the volume of direct real estate investment over a three-year period relative to the current economic size of a city, London took top spot for the third consecutive quarter. Property consultant, CBRE, also said London remained the top city for investment among global property investors who planned to increase their purchases this year. In its Global Investor Intentions Survey 2015, CBRE polled more than 700 global real estate investors, including asset managers and property firms. Interested investors in DAMAC Tower Nine Elms can visit the sales centre at DAMAC Maison Dubai Mall Street in the Burj Area of Dubai, or alternatively contact the team on 00971 4 301 9999.